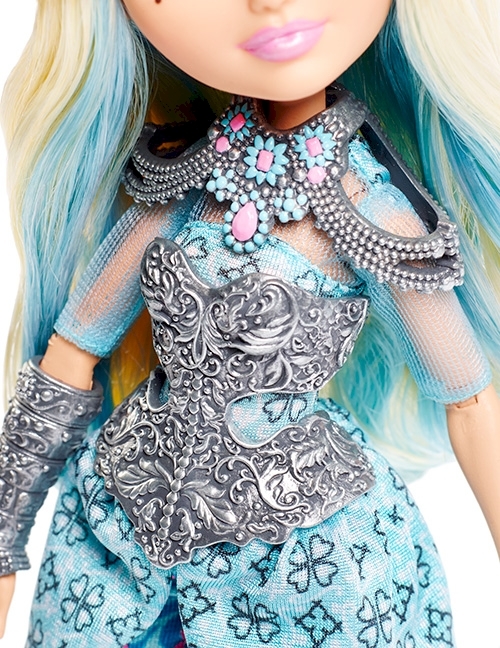 Join the Dragon Games with this Ever After High™ Darling Charming™ doll! In their most epic adventure yet, the powerful princess students see the return of dragons to Ever After High™ -- and with them the return of the most amazing sport ever after, Dragon Games! Raven Queen™, Darling Charming™ and Holly O’Hair™ dolls are ready to play. Each doll is dressed in her epic dragon-riding outfit, complete with metallic gear and signature details. Darling Charming™ doll, daughter of King Charming, is a warrior princess in a fableous blue outfit with royally cool prints, tall riding boots and gorgeous hairpiece in her blue-streaked hair. Armor-inspired accessories are hexquisite. A matching shield doubles as a ring for you so you can join the games, too! Fans can get the hexclusive scoop on the event of the year with the included storybook. Let the games begin! Collect all of the Ever After High™ Dragon Games dolls to tell your own epic tale (each sold separately, subject to availability). Includes Darling Charming™ doll wearing fashions and accessories, storybook and doll shield that doubles as a ring. Doll cannot stand alone. Colors and decorations may vary. Features: The teenage sons and daughters of the most famous fairytales ever, see the return of dragons at Ever After High™ -- and the return of the most amazing sport ever after, Dragon Games! Darling Charming™ doll is ready to compete on dragonback dressed in a fableous dragon-riding outfit. The daughter of King Charming is a warrior princess in a gorgeous blue outfit with royally cool prints, tall riding boots and gorgeous hairpiece in her blue-streaked hair. Armor-inspired accessories are hexquisite and include a shield that doubles as a ring for you! See the story unfold on the Ever After High™ Netflix Original Series “Dragon Games” and get a hexclusive scoop on the event of the year with the enclosed storybook. Collect all of the Ever After High™ Dragon Games dolls to tell your own epic tale (each sold separately, subject to availability; colors and decorations may vary). EVER AFTER HIGH and associated trademarks and trade dress are owned by Mattel. ©2015 Mattel. All Rights Reserved.